Following successful hand pollination, our young Peche de Vigne was carrying a large amount of fruit; far too much for the strength of the branches and too much for the tree to bring to perfection. 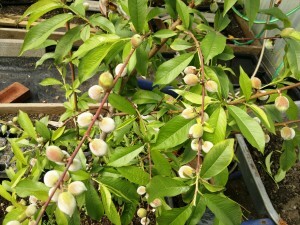 This is quite normal, and, unless the set has been particularly poor, peach fruitlets need to be thinned each season to allow select fruits to develop to their full potential. 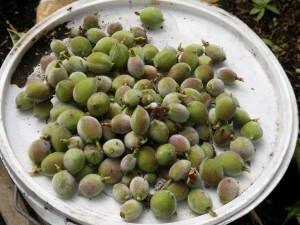 It is also common for fruit trees to naturally shed a certain amount of their crop. 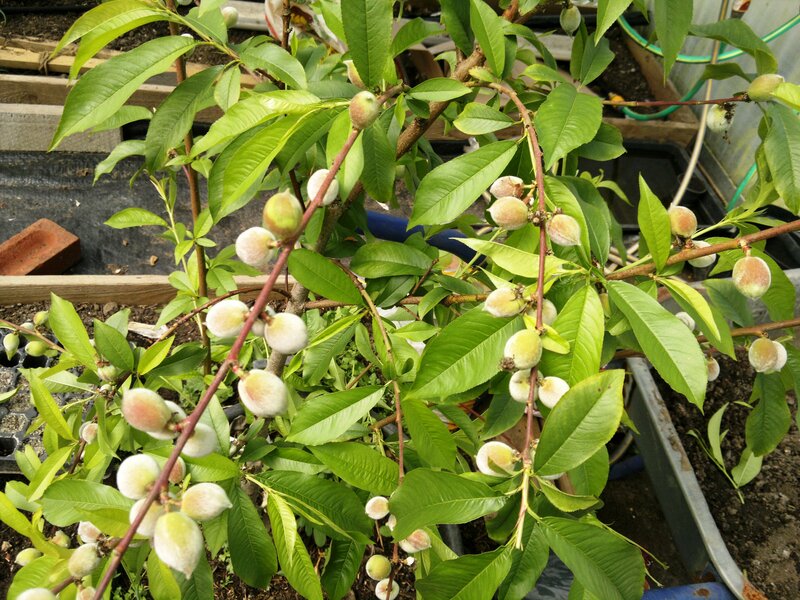 This is sometimes referred to as the ‘June drop’, although with an early fruiting peach it might happen before June and with orchard fruits quite possibly after June. With fruit trees such as apples, thinning may be needed to discourage biennial bearing ­– the condition where the tree bears a large crop one year and very little the next. Some varieties are especially prone to biennial bearing, but thinning the crop should help. With the peach bush, I decided to thin in stages. To begin with, I removed all of the undersized fruitlets. There were quite a few that were already being left behind and would not develop properly. I suspect that these would be shed naturally after some time. 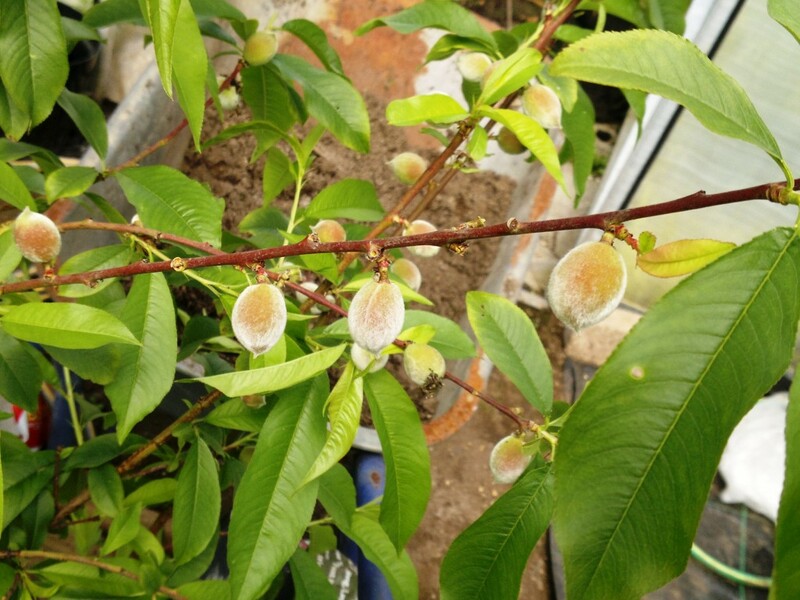 Next, there were many nodes where two or three peaches were growing in a cluster. Each cluster was thinned to leave just one fruitlet. These first two steps are straight forward. The next, though, requires some judgement. I thinned further fruits, favouring those that are large, well formed, and in good positions to ripen. Unless there is some natural loss, I will still need to remove at least half and perhaps two thirds of the remaining fruitlets, but I decided to leave them for a few weeks before thinning further. As a rule of thumb, one might eventually thin the fruitlets so that there is a space of at least six inches between them. Whilst thinning, I also decided that a different approach to pruning and training would be needed. When I was pinching out the surplus shoots a few weeks ago, I was in two minds as to how to proceed. The two approaches I considered were to develop a permanent framework of four or so branches to support fruiting laterals that would be replaced each year, or to leave the structure of the bush more or less as it stands at the moment and develop replacement shoots for the current branches. I decided on the latter and pinched out the shoots accordingly, but considered that, if I changed my mind later, I could revert to the alternative plan after the fruit has been picked. Considering the strength of the branches that are now trying to carry the crop I think that a more robust framework might be desirable. To prevent damage to the branches as the fruits swell, I pushed three bamboo canes into the soil around the bush and used some lengths of twine to provide some support to the most vulnerable branches. 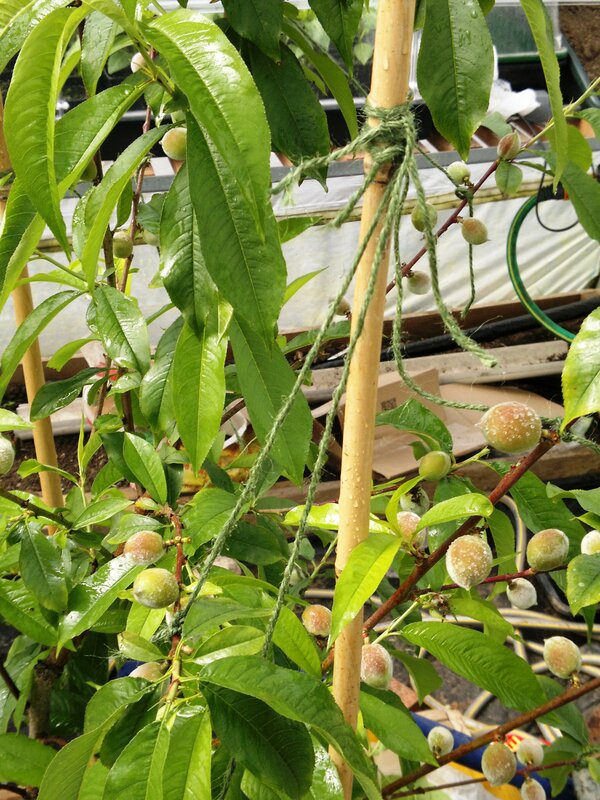 The fan trained peaches will need similar attention soon, particularly the Early Rivers, which is not far behind the Peche de Vigne.